Summary: The Red Death is ravaging Prince Prospero’s kingdom. The ghastly disease produces in its victims “sharp pains, and sudden dizziness, and then profuse bleeding at the pores, with dissolution” (145). Furthermore, “the scarlet stains upon the body and especially upon the face of the victim…shut him out from the aid and sympathy of his fellow-men” (145). Analysis: Nothing strikes fear in a society more than an incurable epidemic. 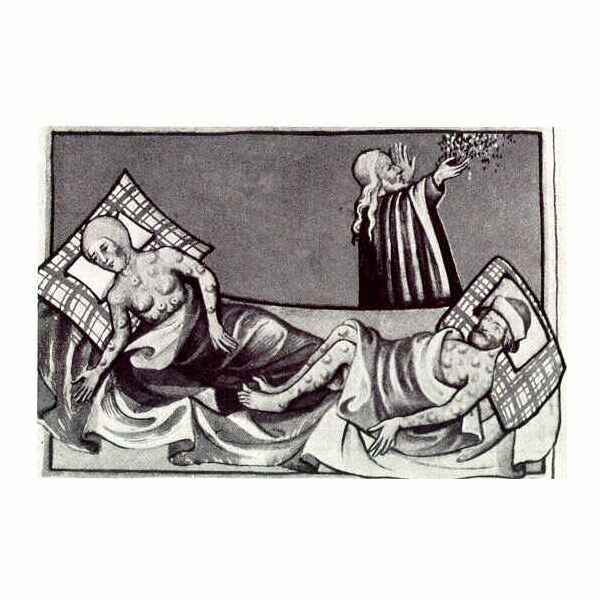 Plagues occurred throughout Europe during the Middle Ages, the most famous being the Black Death, killing an estimated 40% of the European population in the 14th century. Poe creates a fictional Red Death that devastates Prospero’s kingdom much in the same way the Black Death ripped through Europe. The most hideous aspect of the Red Death is the manner in which it disfigures its victims, denying the sick any chance of sympathy. Summary: Prince Prospero, having lost half his population to the Red Death invites “a thousand hale and light hearted friends from among the knights and dames of his court” (145) to reside in his fortressed castle, built especially to keep the Red Death out. The castle contains no way out and no way in. The castle is well stocked with enough food, drink, and entertainment to provide enjoyment for his guests. Analysis: Prospero foolishly believes he can avoid death with some sheet metal and hammer and nails. It is noteworthy that he invites only nobility, not wanting the rabble to interfere with the fun, leading many scholars to conclude that the story is an allegory on feudalism (an economic system in which nobles owned land and allowed peasants to work it in return for a hefty percentage of the crops) and its ultimate demise. Summary: The last thing Prince Prospero wants is for him and his guests to think about death. As a result, he throws magnificent costume parties. Guests freely amble about the strange castle, which contains an imperial suite of seven rooms, each a different color, the last being all black with red window panes. The last room contains an ebony clock that every hour sends forth an ominous sound, stopping the festivities, and causing general uneasiness. Analysis: The Prince is eccentric (that’s what we call weirdos with money) and his castle and parties demonstrate his oddness. Regardless of how much the Prince and his guests try to avoid thinking of death, it is impossible on account of the ebony clock (not exactly sure why the Prince got that clock to begin with). The last room, the one in which no one dares to go, symbolizes death. It is all black. It has blood red windows. It contains an ebony clock. It is at the far western end of the hall (think sunset). It is the 7th room (think end of the week). Summary: Other than that annoying ebony clock that reminds everybody of death, Prospero’s guests are enjoying themselves. As the clock strikes midnight, a heretofore unseen guest makes his way through the party-goers. “The figure was tall and gaunt, and shrouded from head to foot in the habilments of the grave…His vesture was dabbed in blood and his broad brow, with all the features of the face, was besprinkled with the scarlet horror” (149). The Prince, thinking that dressing up as a disease that has killed half his kingdom demonstrates a lack of decorum, orders the intruder killed. 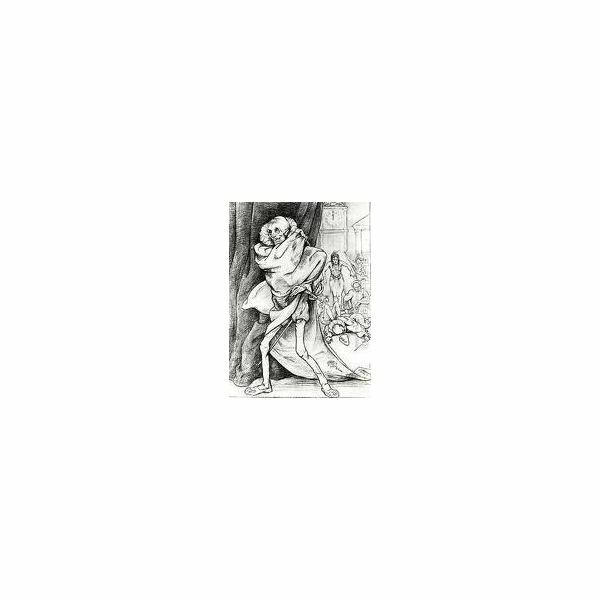 Prospero decides to take care of the intruder himself and in so doing dies. The Red Death has arrived. Analysis: Nothing ruins a party like having the Red Death show up and kill everybody. If you enjoy Poe’s short stories, you’ll love his poetry. Learn more with this Edgar Allan Poe Poetry Study Guide. Poe, Edgar Allan. The Fall of the House of Usher and Other Tales. “The Masque of the Red Death.” New York: Signet, 1998, 145-51. Avoid becoming a bloody mess on your next short story test. Use this study guide and keep the “Red F” away! Symbolism in "The Masque of the Red Death"
Setting, Characters, Theme and Irony in "The Masque of the Red Death"